«The project will halve the emissions of sulfur dioxide into the atmosphere,» the company says. 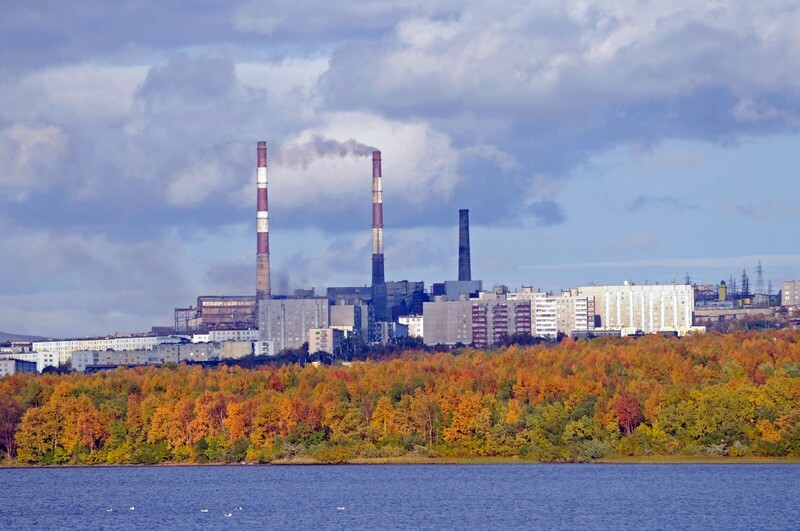 2017 is Russia’s Year of Ecology and Nornickel now says it will take drastic steps to reduce emissions of sulfur dioxide from its factories on the Kola Peninsula, Vedomosti reports. The plan is to reconstruct the concentrating mill in Zapolyarny, Nornickel’s operational director Sergey Dyachnko says to the newspaper. As a result, the factory will be able to separate nickel rich concentrate from the poorer quality high sulfur content material. Zapolyarny has the mines, the concentrator mill and the briquetting [pellets] factory. The pellets are taken to the smelter in the town of Nikel where nickel matte is melted [some 40% nickel content]. The matte is then transported to Monchegorsk south on the Kola Peninsula where the smelter makes pure nickel ready for the market. «The rich concentrate will be processed at the facilities of Nornickel, and higher sulfur content part will be offered to the foreign market,» the company explained. Deliveries are scheduled to begin in 2019, Nornickel is already negotiating with several potential buyers, according to Vedomosti. «The project will halve the emissions of sulfur dioxide into the atmosphere. This is primarily an environmental project,» Sergey Dyachenko says to the newspaper. On question from Vedomosti, neither Nornickel, nor the Ministry of Natural Resources and Rosprirornadzor would disclose the amount of sulfur dioxide being emitted from the company’s factories. The Barents Observer has previously reported sulfur dioxide emission from the ore-briquetting shop in Zapolyarny to drop from 42,000 tonnes to 1,400 tonnes per year. In total, the plants in Zapolyarny and Nikel are believed to have an annual emission of around 100,000 tons of sulfur dioxide. In addition comes the pollution of heavy metals to the fragile taiga forest. Nornickel’s factories on the Kola Peninsula processed 7,5 million tons of ore in 2016. Andrey Zolotkov with the environmental group Bellona says in a comment to the Barents Observer that it is important to remind that we are in the Year of Ecology. «All large polluting enterprises compete in their intentions to make production clean,» Zolotkov says. He says the statement from Nornickel in itself is positive, but argues that the question should rather be «when will it happen? He points to the already modernized briquetting plant in Zapolyarny, supposed to bring down emissions substantially. Last week, however, sulfur dioxide pollution in the town was much higher then allowed, figures provided by Bellona from Roshydromet show. Concentration of sulfur dioxide in Zapolyarny on September 27, 28 and 29 were 1,3 and 3,3 and 1,8 times higher than maximum permitted levels. Screenshot of Roshydromet’s air-pollution records of last week of September. A leading expert on the company’s environmental records is Lars Rowe, Senior Research Fellow and Director of the Russia Programme with the Fridtjof Nansen Institute in Norway. Last month, he told the Barents Observer there are reasons to doubt any serious reduction in pollution. «Nornickel is a company very much in the mould of Russian heavy industry at large: Both historically and presently, its production sites are sources of intense environmental damage. Nornickel has long been one of the heaviest polluters in Russia, if not the Northern hemisphere. The company has not responded in any meaningful way to outside incentives and pressures to curb its transboundary pollution,» Lars Rowe spelled out.